Northwestern Insurance Co., Oswego, NY. 26 1/2 x 30", 150hp engine by Cuyahoga Iron Works, Cleveland, OH. Boiler exploded while assisting stranded schooner J.N. CARTER; 4 crew were lost, 8 rescued. 1862 Enrolled Oswego, NY; operated out of Boston during Civil War. 1865 Enrolled Detroit, MI; 107.46 gross tons. 1866 Owned Charles Carey, Detroit; employed as a wrecking tug. 1868, May Collision with schooner LIGHT GUARD, St. Clair River. 1878, Nov Burned Jones Drydock, Detroit; repaired. 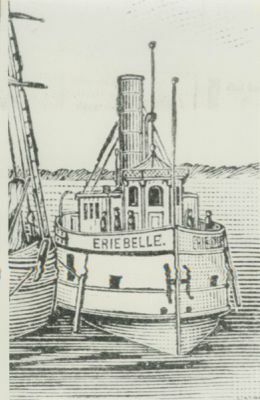 1879 Sold Canadian, renamed ERIE BELLE, C74068; owned Daniel Baptiste Odette, Windsor, ONT. 1880 Owned Odette & Wherry, Windsor; ran Windsor - Leamington, ONT. 1882 Rebuilt Jenkins Bros., Windsor; readmeasured 292 tons. 1883, Nov Lost, Lake Huron.